Zeref NM will be open from Jan 25 (Fri) 22:00 through Jan 29 (Tue). - If there is no Mavis and no Natsu in the Team: all effects in play will be cancelled by the enemy at the beginning of the first Round, and CDs, EPs and accumulated Rounds of all Monsters will be reset. - The columns of Runestones on the far left and far right sides will be masked at the beginning of the first Round. - When a Dark Combo is made, attacks of the Team will be nullified. The more Dark Combos made, the more times the enemy attacks in the Round. Only the first batch of Runestones dissolved will be counted. - Team Recovery becomes 0. - CD of the enemy's first attack will be 1. - All Runestones will be in black and white. - The enemy will receive Damage only when Water, Fire, Earth, Light and Dark Runestones are dissolved in the same Round. - Heart Runestones cannot be dissolved. - When current HP is above 80%, the next Damage received will not lead to your defeat (max one activation per Round). - When current HP is less than 25% (before spinning), this Monster's ATK and REC 2.5x. - Turn all enemies to Dark and reduce their Defense to 0. Effect persists until the enemies die. - While the effect is active, Dark damage dealt on enemies 2.5x. - Convert Light and Heart to Enchanted Dark. - At the start of next Round, convert this Monster's column into Enchanted Dark. A new Account Anniversary reward will be given for the Jan 27 2019 - Jan 26 2020 period. For the four days of TGS, a new stage will be available to play daily (from Jan 24, 17:00 to Jan 28, 16:59). The stages will have fixed teams. Clearing each stage for the first time rewards 1 Harpy, 1 Baby Harpy Knight and 1 random Alpaca. This is pretty much the Scissors Paper Rock event from HxH with a fresh coat of Fairy Tails paint. Move through the maze once each day by logging on to campaign site. Encountering a Fairy Tails character may add him/her to your selection pool, i.e. Not guaranteed. The choice of direction is not linked to encountering a Fairy Tail character - it is random so pick anything you want. Daily participation gives rewards irrespective of whether or not a Fairy Tails character was encountered (Souls, Gold etc.). You have three slots for encountered Fairy Tails characters to go in. Members have indicated that you will escape the maze after encountering your third Fairy Tails character and can only log on for daily loots. You need a VPN to participate. Was pleasantly surprised to receive these in the mail! It is a seal draw card with the actual christmas card inside. 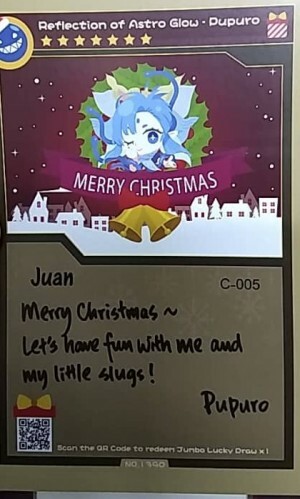 Card is personalized. I was expecting sexier Pupuro though. Hahaha not bad. 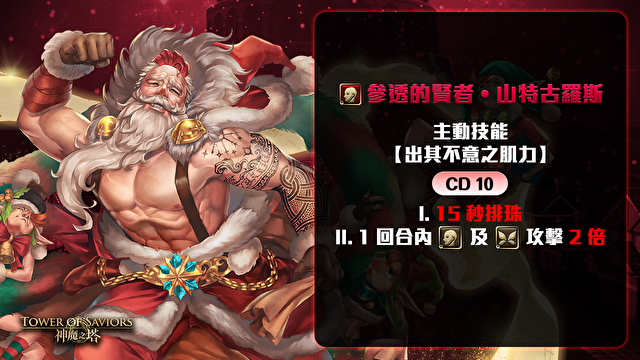 Hey so uhh PR Santa's here, just want to give kudos to the guy some years ago who predicted him being a buff old man. Hat's off to you! I think my game glitched out..